It’s just past 5 AM, here on the North Slope. I just got off nightshift, where I work as a mechanic in the winter. I’m tired. Yet I sit down this morning to write. Simply because what I have to say will not write itself. Personally I believe that the best thing we can pass on to one another is the fact that we are vulnerable. Yet it seems that most things in print, regarding adventure, tend to celebrate the author. What a shame it is to paint ourselves in a light that WE deem appropriate for viewing. Put more clearly, much value in a story is lost in pride. Having said that, I am glad to continue the saga of this real occurrence in the Bloody Falls of the Coppermine River, in the fall of 2013. Where were we… aah yes, Jason and I were up the Coppermine in one tiny boat with no paddle. The sun was setting. We were soaked to the bone and weary from our long swim in the river. I cannot say enough how much I appreciated the Stormr clothing I was testing. Poor Jason was not clad in neoprene and was shivering violently. I was wet, but near sweating as we began our tandem hand paddle across the river. Walking the shallows behind Jason. Broken helmet in hand. If you ever want to laugh at yourself, while testing your skills in teamwork, load up in a flat bottom packraft and hand paddle 500 yards of cross current – it’s like two people riding on a unicycle might be. Our boat filled with water immediately. As our arms swept back each time, the rush of elbow-deep water half propelled us, half pumped water inside. We were at full saturation in no time. This affected our stability tremendously. Yet when we slowed our paddling, we made no progress across the current. Besides, the boat floated fine while full of water, so after a point, the problem did not worsen. My favorite part of the paddle across was that we had lots of pure clean Arctic water to drink along the way, of which I enjoyed liberally. Yet I had to be careful when I drank a palm full, because paddling with only on hand sent us spinning like a top. We spun a lot, which caused immediate laughter and grunting combined, as we flailed to get back on track. The paddle across was a very good thing. It kept our blood pumping. Jason stopped shivering although his legs were freezing in the ice water bathtub we were sailing in. Then, just a few hundred feet from the shore, Jason said, “Hey! I see your boat!” And sure enough, there it was, a couple hundred yards downstream, yet back across a major channel, on the beach of a large island. Re crossing a main channel after Jason spotted my boat. I opted to hop out of the boat, letting Jason continue to shore. My plan was to wade the shallow water at its widest point, get to the island and recover my boat. I thought even floating out may be possible with two boats. But I had come around to my pipe dream of paddling with caribou shoulder blades…I still think it would be cool. 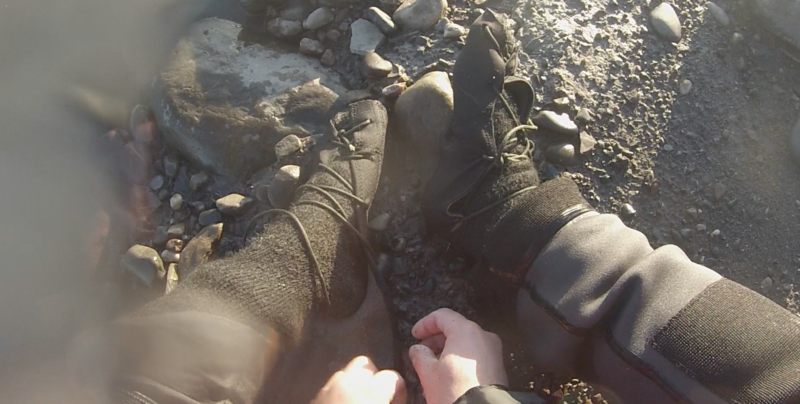 So off I went, feebly hobbling in my stocking feet over the softball-sized rubble in the river. Thankfully the rocks were smooth and did not cut my feet. Not that I would have known. I could see them and I could use them. But I could not feel or move them. I stomped on like a short circus clown on fleshy cold stilts. 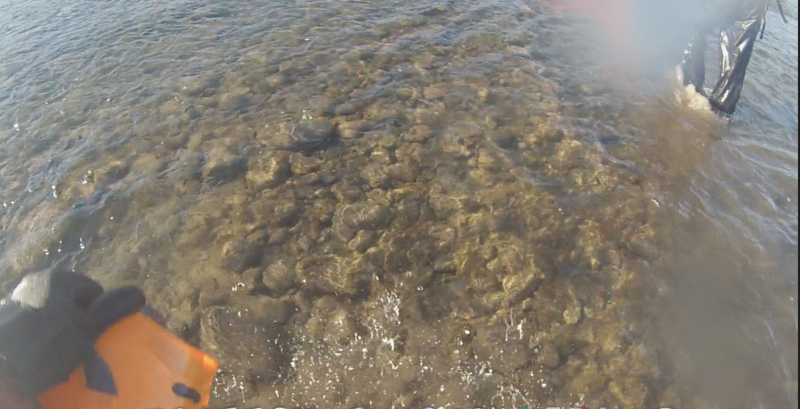 Pounding into the rocks and water to secure a foothold in favor of falling and swimming again. I worked my way upstream in thigh high water. It was at its shallowest and there was one more deep section I could not avoid. As I approached this crossing, I recalled some of my childhood. I was a four-eyed nerd of 11 years. My dad was a very strong man, an outdoorsman and an avid hunter. I went hunting with him a lot. I never really got good at hunting the way he did – because I wasn’t there to hunt. I was there to be with him. I wanted to show him I could do it. Whatever “IT” was. I wanted to prove myself to him. So the things he taught me about the wilderness were not likely what he thought I would learn. What I learned largely came as a result of just being out there. I remember a hunt, where we left the truck before light. We were hiking in deep at a place called Snow River. We were on foot. No four-wheelers or base camps, no “Mountain House” meals or pocket warmers. We were not well off. But we never went hungry, oftentimes because my dad could hunt. Many of our hunts took place before or after work. He would put in the time and eventually there would be meat in the woods that needed carrying. That’s where I came in…because stacking huge moose parts on my scrawny back was a great way to impress my old man. Really looking back, I was more excited to see how much I could carry, than I was to eat moose steak. And I couldn’t have cared less about shooting one. So there we were hiking in deep. I had hard rubber boots on, lined with cotton socks, then very cleverly encased in “Wonderbread” sacks. These sacks were the Osborn family gaiters. One thing was for sure when you wore the sacks. You were going to get wet. It is my firm belief that dad had us wear these sacks so that by the time we felt how cold that glacier water really was, we were to far from shore to turn back. We crossed river after river that day. I was not heavy enough to fight the current, so I would stand just downstream of him and grip his coat while he gripped mine. Then when my feet came off the bottom, I held one toe under the other, so my boots would stay on. I remember scratching up the bank after a doozey of a crossing, dumping my boots out and digging out a sandwich with my shivering wet little hands. I didn’t want to scare it and was trying to count brow tines to make sure it was legal. Then it vanished into the thick brush. Dad was all about chasing it down and wished I would have taken a shot. We hunted around a little, then decided to head back. At the time my only thoughts were “I’m glad we didn’t get a moose today and my old man is crazy.” I did not want to carry a moose out of this place. But apparently he did, and figured I was up to carry meat as well. I look at that day different now. I realize that on that day and many like it, he quit early at doing what he loved, because he was looking out for me. He was fine with pressing on always. But he knew what I am just learning. How to be a dad. How to introduce your children to life, without smothering them in it and ruining their taste for it. With my dad I knew this: I didn’t ever have to go if I really didn’t want to. But I was always invited and would always be expected to do my part. So 25 years later while wading the Coppermine in stocking feet, cold, tired and a little intimidated, I found strength in the fact that I had been here before. I had marched and clawed my way up muddy banks carrying a man-size load. Since well before I thought it possible, I had been pressed to stretch my limits of ability. Another barefoot crossing. Using what my father taught me. I said “Thanks Dad” as I pushed into the deep water. I took a stumble, close to the other side, but didn’t fight to hard. I was going in again and embraced the fact. The ice water flushed my jacket, making me gasp. But in a few smooth strokes, I was at the bank with my tender feet under me again. Water pouring out of my cuffs like a freshly yarded submarine, I made my way up to the bank. I pulled up my socks and felt my toes. They seemed fine, though I would not know until they thawed. I was amazed that there was no blood, either. I scampered up the soft sandy bank of the island and moved silently through the brush, pondering about the native people of that country and how smart they were. What a “Tenderfoot” I was. Literally. I speculated they would laugh at such a stunt. For they were motivated by survival. But modern man is comfortable in surviving. We encounter danger in the wild by choice, where they had their fill of it daily. They were content with a good meal in an empty stomach. We are contented by a good scare in an empty life…I believe this is why we gamble and ride roller coasters etc… because calm contentment has been lost on the path to comfort. By the time I got to my boat, I felt my feet again. They were puffy and throbbing. But not for long, because I waded to my boat in the shallows, flipped it over, striped the skirt and got in. It turns out that single-hand paddling also fills your boat with water. I proved that on my way to Jason. The trip was not far, but I stopped often to rest and was conscious of this exhaustion indicator. 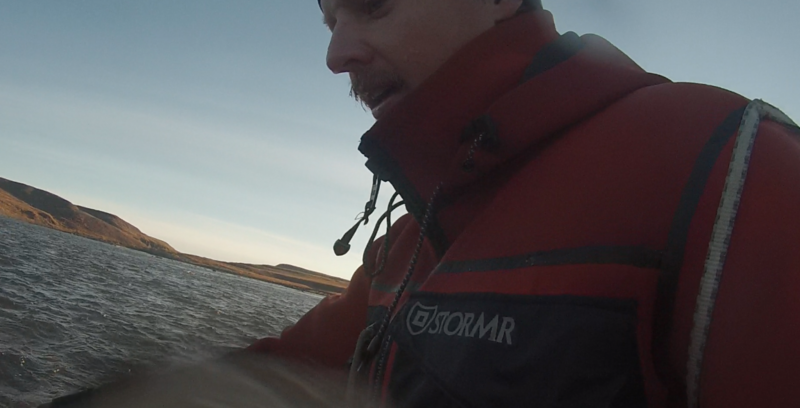 I drank more water and paddled with an angry fury that set me on the bank in no time. However, I was depleted and felt the urgency to move more than ever. We would not fare an overnight well in this state. 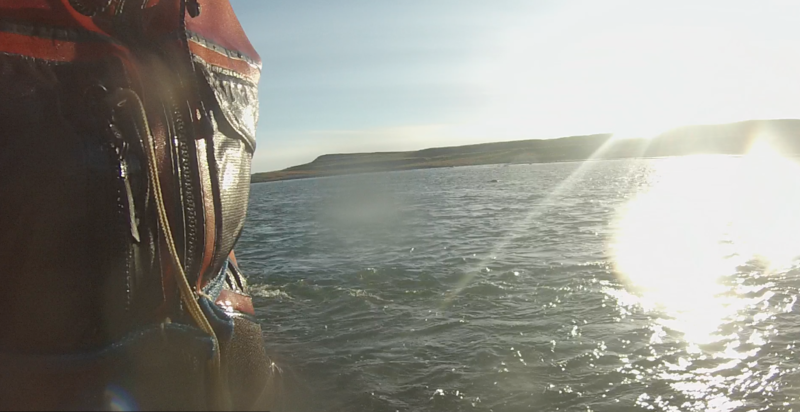 We wasted no time deflating the boats and agreed completely to take the 10 mile land route back to Kugluktuk immediately. I needed shoes for a 10-miler. So after a brief inventory of my gear, I decided to I cut my neoprene “Stormr” hat into two pieces. Then, removing my bow-line from the boat and piercing eyelets into the neoprene, I set to work lacing the improvised moccasins onto my feet. Stormer Hat prepped for use as footwear. As I did so, I recalled a saying our new friend Samantha had shared the day before. She is an Arctic bush pilot and uses the saying “Safe home”. Final lacing of the Hat Foot shoes. I wanted Safe Home. I wanted to be in our friend’s apartment just 10 miles away before nightfall. I didn’t want our friends to worry, or come looking for us. Within a few minutes, I was able to fashion some dandy moccasins. They were surprisingly secure and comfortable. We clawed our way up the 100-foot bank toward the trail and started hiking. At the top, we took a minute to reflect and record our thoughts from the past few hours. We were both glad to be alive. A few miles down the trail we saw some four-wheelers stopped a ways up ahead. 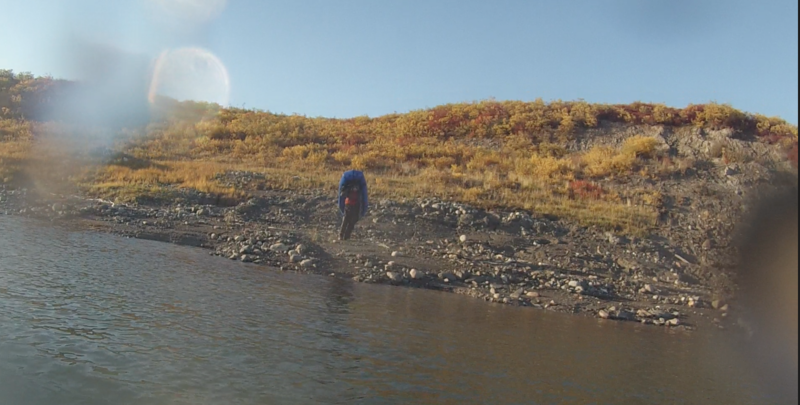 Jason was limping from the beating his thigh got on the rocks. I got the big water. Jason got the big rocks. I think I got the better deal. Anyway, I ran up ahead and caught up to the four-wheelers. They were two local Inuit men who were conducting a search and rescue for a lost hunter. They had found the hunter earlier and were now hunting, themselves. 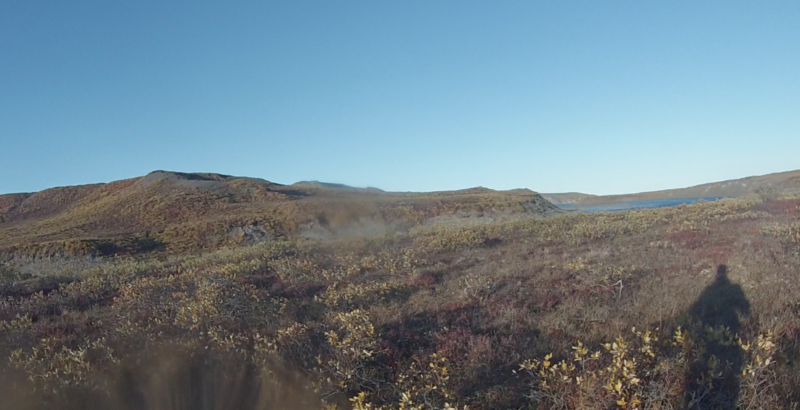 It was getting too dark to shoot now anyway when they offered us a ride to Kugluktuk, which we gladly accepted. I donated my last cash to the men on the four-wheelers and asked that they use it for gas when helping others. I wonder if I would have given that money to the search team, had they not given us a ride. I’d like to think I would. But I’m not sure…I was near broke as it was. To summarize the Bloody Falls experience in a few lines would be difficult. But the biggest thing I took away from that river was an icy fresh reminder that our lives are precious. They are the greatest gift we have. And though our names may not go down in history for meandering through the Canadian Arctic, our personal journeys are as real and powerful as anyone else’s in history. If we have chosen paths in our life, based on boredom, chance or loneliness, we should watch the horizon for what suits us best and not dig too deep into random happenings. We should be malleable to the lessons of our errors. So that when the right opportunities and people come into our lives, we are prepared to receive them and appreciate them, for the gifts that they are. We’ve heard both versions from you and Jason, and it is even crazier when we read it. Next summer when you are wondering around the Arctic, keep safe (Jesse safe, not regular person safe). Oh, loved the part about your childhood Wonderbread gaiters. Such resourceful Osborns you all are!